There’s a legend of a pond in one of the temples in Beijing where the carp will be magically replaced by the temple deity – it doesn’t matter how many are poached or die. So here is my latest (tall?) story for your delectation. Picture it: me dressed head to toe in fisherman’s gear (the stuff you got me at the market), a couple of plastic buckets and an umbrella. The tea – house in the middle distance, the lake, and me standing on that little walk-on island in the centre of it. I’m shining a flashlight onto the lake looking for koi. It is the middle of the night at the beginning of winter. There are a few red leaves left on the maples but most of them have blown away or fallen into the water. Bárbara Rodríguez Muñoz: Your earlier works, such as Urban Pastoral, presented a juxtaposition of real and illusory spaces though projecting photographic slides onto different surfaces, such as gardens and buildings. Does the work in progress Hokkaido Postcard, follow the same line by using a factual tone to present a seemingly fictional history? Justin Coombes: In some respects, yes. This ‘Nishikigoi Letter’ is the first work in a series of image-texts I am working on, which will be presented ‘by’ and about a range of fictional characters. In each case, a description of the picture is elaborated into a fantasy that gives the viewer information they would never find in the photograph itself. For this project, I stopped using projection. Perhaps now the ‘projection’ is the fictional intervention, in part textual, I make into the scene. BR Did you use long photographic exposures, as in your earlier works? I can picture you trying to capture the final image in the same way that your protagonist is patiently waiting to catch a carp. Is there a relationship between the technique and the narrative, which both refer to the passage of time? JC Yes, absolutely. I was thinking about the process of photography itself, how it relates to time and to everyday processes like walking. About ninety percent of the pre-production time for this project was spent taking reconnaissance pictures. While I was doing this, I was trying to conceptualise potential stories, locations and characters. I was also keeping these things unfixed enough so that when I came to the final shoots, I would still have a lot of leeway for spontaneity, and that I could write the accompanying stories later, which is what I am doing now. 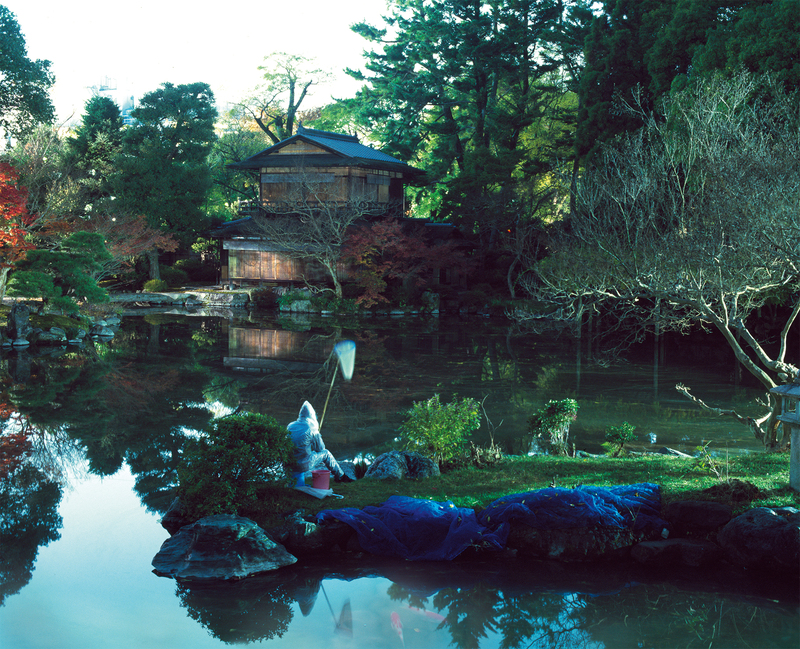 This time, I was on a residency in Kyoto in Japan for three months. I had limited resources – money, time, (lack of) ability to speak the language – and these limitations made me focus to a greater degree than usual on certain things. I became more aware of the parallels between photography and those activities that I was able to do: walking, fishing, tourism, and shopping. JC There is that wonderful French phrase, ‘l’esprit d’escalier’, which refers to a situation where you think of a witty put-down or elegant argument only after you have left the party or dispute where it was required. This phrase came to me several times while I was shooting, and will remain with me during postproduction. One of the ironies of taking photographs is that the camera takes in all of this information, but you as a human being, with your limited knowledge, don’t understand all of it. After making this Nishikigoi (carp) picture, I found out that the Japanese character for ‘carp’ is the same as that for ‘love’. Discovering this kind of information after the fact feels very significant to the project. I was in Japan trying to immerse myself in the culture and perhaps trying to take in too much information at once. So once I realised I was over-reaching, I decided to instead, to paraphrase Christopher Isherwood, ‘become a camera’ for a while. BR This group exhibition, ‘Le weekend de sept jours’, which will feature ‘Nishikigoi Letter’ invokes an open space to experiment and play. The ambiguity of your work seems to engage with this idea of playfulness. BR Your photographs have a pictorial quality. How would you describe this categorisation of your work? JC I think quite a lot about pictorial art, and figurative art in general. I have an ongoing scrapbook of images, both paper and digital, that are important to me. Perhaps what is most memorable about them is a sense of the uncanny; that the image might have always existed; that it is unique and archetypal. At the same time, it reminds you of other things and other pictures, but if you actually try to pin them down, the image resists such easy categorisation. I also seem drawn to images that invoke words and descriptions. I suppose I try to emulate those qualities in my own pictures, and this latest series is a literal exercise in doing that. I have made some pictures that, for me, elicit words. Now, what should those words be? BR What are your thoughts on photography as a medium in relation to your work? JC I believe that there is a parallel that still hasn’t really been explored as much as it might have been yet, between photography and fiction-making. An author is like a detective who gathers information to piece together a story following hunches, but unlike a detective, there is not one single ‘truth’ the author is trying to pinpoint. Rather, the author has an obligation towards a poetic truth, and that gives her or him a wonderful freedom to change the narrative at certain points. I’m envious that an author can so readily change a white horse into a brown one. The camera often doesn’t allow that freedom – it sticks to the dumb materiality of what is in front of it, and digital technology can make one even more of a slave to that materiality. So when I shoot, I like to have a number of props that can be used for improvisation – Rauschenberg talked of a ‘palette of objects’ – and, in a limited way, this spontaneity affords me some of the freedom of a writer. Sometimes this way of working seems very silly – particularly when others are helping me and it is not working – but at other times, it is exhilarating and feels right. Now I am writing in a more concerted way than before. I’m reminded that the grass is always greener; the writer has a whole other set of rules that the photographer does not need to worry about.